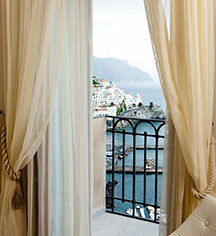 Located in a 13th-century monastery, which once was home to Cistercians monks and Cappuccini friars, the Grand Hotel Convento di Amalfi is perched on a cliff top high above sea level with spectacular views of Amalfi and the Mediterranean Coast and only steps away from the historic city center and the harbor of Amalfi. Included as one of the UNESCO World Heritage Sites, Amalfi is a picturesque town along the southern coast of Italy, surrounded by dramatic cliffs and exquisite scenery. Once the capital of the maritime republic, the town of Amalfi was an important trading power in the Mediterranean between 839 A.D. and around 1200. In medieval culture, Amalfi was famous for its flourishing schools of law and mathematics. Flavio Gioia, who is traditionally considered the first to introduce the mariner's compass to Europe, is said to have been a native of Amalfi. With the foundation dating back to 1212 by the Cardinal Pietro Capuano, the original site became an abbey in 1223, and was directly dependent on the Cistercians. The monks left in 1452, and the University of Amalfi restored the complex. In 1583, the Cappuccini friars obtained the convent, staying for more than two centuries. Converted into a hotel in 1882, the Grand Hotel Convento di Amalfi has been and still is one of the most significant monuments of the entire Amalfi Coast, providing a long history of exceptional hospitality to royalty, aristocracy, and celebrities. Two of the most celebrated visitors to Amalfi were the composer Richard Wagner and playwright Henrik Ibsen, both of whom completed works while staying in Amalfi. Beautifully refurbished, the five-star Grand Hotel Convento di Amalfi harmoniously blends modern comforts with the hotel's historic past. It seems suspended in mid-air between the brilliant blue sky and the sparkling azure sea with its 53 intimate and quiet guestrooms, spacious suites, panoramic restaurant, infinity swimming pool, wellbeing oasis, and authentic regional cuisine. NH Collection Grand Hotel Convento di Amalfi, a charter member of Historic Hotels Worldwide since 2011, dates back to 1212. This property was originally a 13th century Cistercians monastery. Cancellation Policy: No charge will made to your credit card if you cancel your reservation at least 48 hours before your arrival date (local time). If you cancel within 48 hours of your arrival date then 50% of the total cost of your stay will be charged to your credit card. Hotel/Resort Fees & Taxes: A tax is imposed by the city: EUR 5 per person, per night. This tax does not apply to children under 10 years of age. Parking: Valet parking (surcharge), Offsite parking reservations required. Payment: All forms of payment are accepted. Payment is required at time of booking. Visa, MasterCard, Amex, and Diners Club International are accepted. 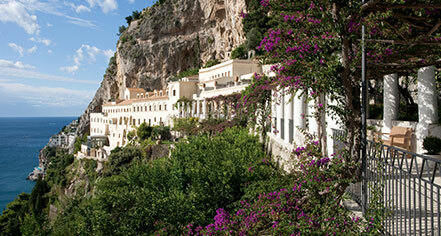 Learn more about the History of NH Collection Grand Hotel Convento di Amalfi .